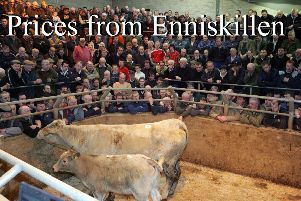 A sizeable bank holiday sale at Omagh met keen demand for forward and quality sorts. Lighter, plainer sorts have eased slightly. Bullocks: Q. Harpur, Castelderg 710k £1455; 550k £1170; 670k £1395, M. McCrossan, Seskinore 655k £1440; 630k £1305, Geo. Harpur, Mountjoy, 640k £1400; 535k £1135; 655k £1355, F. Ferris, Leglands 575k £1255; 510k £1195; 535k £1200; 570k £1225, M. McCullagh, Carrickmore 555k £1285; 535k £1150; 595k £1260; S. Owens, Beragh 510k £1120; 600k £1245; R. Gallagher, Seskinore 580k £1250; 620k £1280; 555k £1145; A. O’Kane, Pomeroy 535k £1140; 550k £1100; K. McAleer, Mountfield, 600k £1290; 575k £1225; 460k £1030; Jas. Callion, Dromore 680k £1455; 500k £1030; F. Smyth, Dromore 550k £1160; M. Hamilton, Drumlea 580k £1200; M. O’Neill, Donemana 615k £1265; 700k £1420; 660k £1340; 715k £1420; C. Monteith, Tullyrush 650k £1330; Gordon Fulton, Dromore 390k £930; 410k £330k £800; S. Britton, Donemana 460k £1080, D. Hume, Strabane 405k £950; 485k £1135; 450k £1035; 495k £1125; C. O’Hagan, Eskra, 480k £1120; 450k £1010; R. J. Keys, Dromore 460k £1035; A. J. Brown, Lack 420k £905; 350k £820; R. McPhilemy, Newtownstewart 490k £1035; 455k £965; G. J. King, Knockmoyle 310k £705; 340k £755; 380k £790. Heifers: M. McCrystal, Ballygawley 510k £1130; 505k £1100 and /31080; 490k £1100; D. Maguire, Urney 615k £1300; 600k £1220; D. W. Johnston, Lack 515k £1090; 500k £1050; R. Rea, Clanabogan 590k £1230; 595k £1220; 565k £1140, N. Armstrong, Lack 600k £1240; 515k £1070; 485k £990; P. J. Mullan, Tattyreagh 515k £1050; C. O’Hagan, Eskra 525k £1065; 455k £930; W. Wilson, Ardstraw 530k £1070; 565k £1130; S. Britton, Donemana 455k £1050; 460k £980; W. Doherty, Strabane 480k £1050; 490k £990; E. Swift, Irvinestown 460k £990; 450k £940; 455k £940; D. Gillan, Garvagh 450k £970; 350k £835; C. Campbell, Tattykeel 420k £860; H. McPhilemy, Newtownstewart 410k £830; 380k £785; B&K Duffy, Belleek 315k £650; B. Jones, Ederney 345k £700; 315k £640. Fat cows: Sean O’Kane, Drumquin 710k £196; Patk. Slane, Carrickmore 680k £188; D. Fox, Carrickmore 550k £184; Ballinacross Farms, Donemana 710k £174; 650k £168; M. O’Neill, Donemana 800k £173; J. Bradley, Plumbridge 540k £160; P. Daly, Carrickmore 550k £160; L. Foster, Dunamore 610k £157; Loane Partners, Kesh 650k £155. Friesian cows: N. Houston, Strabane 560k £156; 550k £149; G. Fulton, Dromore 640k £131; 670k £124; 680k £117; W. H. Cummings, Castelderg 630k £126; 720k £126; 660k £122; J. Elliott, Castlederg 810k £125; Hall Kee, Strabane 590k £124; 630k £119; D. Donnell, Ballymagorry 770k £123; W. J. Hamilton, Castelderg 640k £121; M. Elkin, Omagh 720k £120; 730k £120; B&S. Sloan, Irvinestown 850k £120. Dropped calves: K. Lynch, Castelderg £420 Charolais Bull; N. Daly, Omagh £370 Charolais Bull, £350 Charolais Heifer, B. Walker, Omagh £370 and £320 B. Blue Bulls; £300 B. Blue Heifer; P. Ward, Douglas Bridge £330 Hereford Bull; K. Warnock, Trillick £320 Limousin Bull; £280 Limousin Heifer; C. Caldwell, Killen £310 Limousin Bull; £275 Limousin Heifer; Jas. McFarland, Omagh £300 Angus Bull; Nigel Irwin, Enniskillen £300 Limousin Heifer; C. McAleer, Drumnakilly, £290 and £270 Hereford Bulls; A. Rutledge, Fintona £300 Hereford Heider; M. Beattie, Fintona £265 Simmental Bull. Wednesday, April 4: The sale of wintered suckled calves saw a very large entry of 535 calves sold to an excellent trade, with buyers showing no sign of concern about the delay of spring. Bull/Bullock Calves: N. McGarrigle, Irvinestown 400k £1075; 440k £1075; 340k £900; R. Scott, Gortin 445k £1100; 505k £1160; 350k £900; S. Kelly, Carrickmore 425k £1055; 445k £1035; M. McCracken, Mountfield 400k £960; 320k £800; S. F. Laird, Ardstraw 430k £1025; 410k £970; 425k £970; 445k £990; P. Horisk, Errigal 420k £975; 335k £890; 265k £780; J. Smyth, Killen 405k £930; J. Donnelly, Drumquin 430k £985; 400k £920; 355k £910; 345k £900; S. McGirr, Ballygawley 405k £925; 425k £925; 370k £905; J. T. Robinson, Claudy 440k £1000; 360k £990 (275p); G. Milligan, Ederney 405k £910; D. Gillan, Garvagh 445k £990; E. O’Kane, Clanamore 405k £900; 390k £935; B. McCullagh, Greencastle 350k £980 (280p); 385k £1050; M. Quinn, Dromore 300k £825; S. O’Brien, Loughmacrory 330k £890; 265k £760; 270k £730; Ian McFarland, Clanabogan 305k £800; L&M Farms, Mullaslin 330k £845; Loane Partners, Kesh 340k £855; 350k £890; 295k £775; C. Devine, Strabane 315k £790; M. Armstrong, Dromore 350k £890; J. Woods, Beragh 360k £895; I. McCusker, Dromore 335k £830; D. Hume, Strabane 395k £960. Heifers: D. Hume, Strabane 415k £965; 320k £780; 360k £845; R. Scott, Gortin 410k £925; 415k £890; 365k £830; 385k £835; M. Armstrong, Dromore 405k £835; Kevin O’Neill, Dromore 385k £955; 370k £880; C. Jack, Ardstraw 310k £755; 300k £735; E. A. Elliot, Drumlegagh 310k £750; 305k £735; Wm. Crawford, Newtownstewart 385k £800; I. McCusker, Dromore 355k £835; A. Mitchell, Drumquin 310k £725; 340k £775; E. Loughran, Carrickmore 315k £730; M. McCracken, Mountfeild 355k £805; 385k £835; Patk. McNabb, Drumquin 385k £350k £770; E. Loughran, Carrickmore 370k £815; S. Armstrong, Pettigo 265k £655; 290k £645; F. Fox, Carrickmore 285k £685; F. Thompson, Ederney 250k £600; F. Quinn, Cookstown 235k £600. Suckler cows sold to a top price of £1,740 paid for a first calver Simmental with blonde heifer calf at foot.